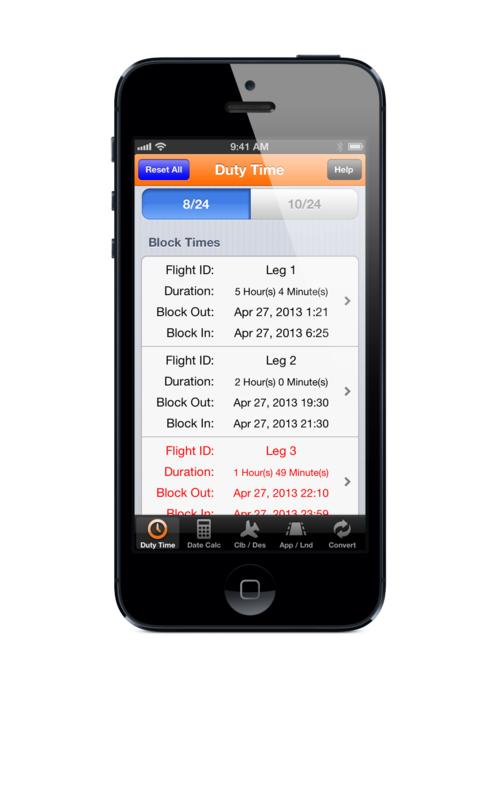 The only iPhone app that computes your "rolling" block/flight time requirements, in accordance with FAR 135.267! Have you been waiting for an all-encompassing Part 135 Application to come along to assist in the laborious calculations associated with the job? Ever wonder how nice it would be to be have an iPad/iPhone App compute your “rolling” block/flight time requirements, in accordance with FAR 135.267, whether you are a single pilot (8/24) operator or dual piloted (10/24) operator? What about an App to assist with computing Departure Gradients, Climb Performance, Enroute Descents, Approach Planning Descent Distance and Timing, Landing Performance summaries including wet, dry and DAAP calculations, Runway Gradients and daily utilized aviation conversions? The wait is over! The Pilot Aviation Duty and Performance Calculator Application offers all these calculations wrapped up in a single application. It also includes a Date Calculator that makes it easy to compute the common Minimum Equipment List (MEL) due dates or even your 30 day VOR Check. You no longer need to fill your iPad/iPhone with countless Apps to get the aviation information you desire, everything you need is included in this one simple to use App. Although this App is geared toward Part 135 operators the various calculations can easily be adapted for use by all Part 91 General Aviation operators as well as Part 121 Commercial Airline pilots. There is something here for every professional pilot.